Republicans had 2-1 advantage in special interest spending, most of it for Walker. About four dozen special interest groups reported a record $36.5 million in independent expenditures in Wisconsin’s statewide and legislative fall elections, according to a Wisconsin Democracy Campaign preliminary review. Fifteen GOP groups ended up outspending 34 Democratic groups more than 2 to 1. Republican express advocacy groups spent nearly $24.6 million compared to $11.9 million by Democratic groups, according to reports filed as of Wednesday morning. Some additional spending reports or amended spending reports may be filed in the coming days or weeks. The previous record for express advocacy spending was $18.9 million in 2014, so the spending this year was nearly double that. Express advocacy groups sponsored broadcast and online advertising, mailings and other electioneering activities that use the magic words “vote for” or “vote against” or their equivalents. The Wisconsin Democracy Campaign also found that the vast majority of outside spending – more than $24.4 million or 67 percent – was in the governor’s race, where Democrat Tony Evers defeated GOP Gov. Scott Walker’s bid for a third four-year term. By office, reported outside spending topped $6.4 million in 39 of the 116 legislative races on the ballot. The state attorney general’s race, where Democrat Josh Kaul defeated incumbent Republican Attorney General Brad Schimel, drew more than $5.3 million in outside spending. Republican Governors Association spent a total of more than $10.9 million using two entities, Right Direction Wisconsin PAC and ACC Wisconsin PAC. The association is a 527 group that raises and spends unlimited amounts of money from any source in order to elect GOP governors across the country. Previously the association spent an estimated $18.4 million to help Walker in his 2010, 2012, and 2014 elections. Americans for Prosperity spent more than $7.4 million. This Koch-backed unregistered independent expenditure committee spent most of its money, nearly $7.2 million, on TV ads to back Walker. The remainder was spent on Republican candidates in 17 state Assembly and Senate races. Wisconsin Freedom PAC spent more than $2.8 million. The corporation was used by the Republican Attorneys General Association to support Schimel’s reelection. The association, which is also a 527 group, raises and spends money to elect GOP state attorney generals across the country. Greater Wisconsin Political Independent Expenditure Fund spent about $2.3 million. This corporation is one of four entities used by the Greater Wisconsin Committee to elect Democratic candidates to state and local offices. 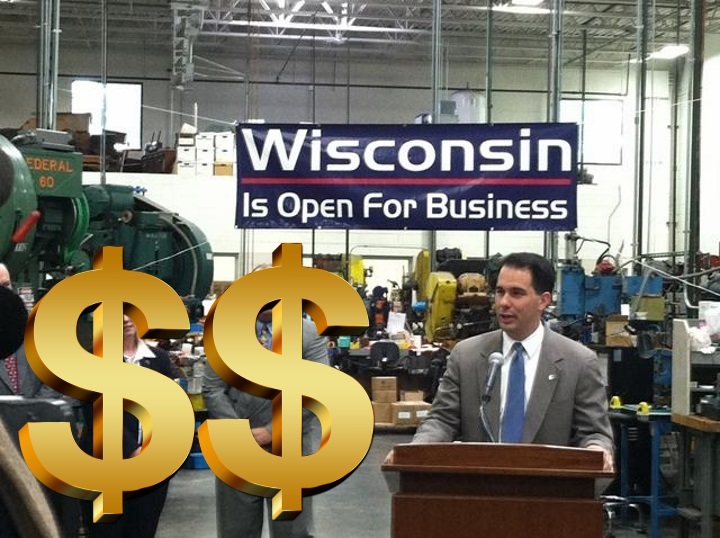 The group spent more than $1.5 million in the governor’s race to back Evers. The remainder was spent in three state Senate races. DAGA Wisconsin People’s Lawyer Project spent nearly $2.2 million. This corporation was used by the Democratic Attorneys General Association to support Kaul. The association, which is also a 527 group, raises and spends money to elect Democratic state attorney generals around the country. Wisconsin Conservation Voters Independent Expenditure Committee spent nearly $1.1 million. This corporation is run by the Wisconsin League of Conservation Voters to support Democratic candidates. It spent about $651,750 in the governor’s race to back Evers and the remainder in two state Senate races. The WDC review of outside spending does not include unreported spending by phony issue ad groups, which smear or praise candidates without explicitly telling viewers who to vote for or against. Eight issue ad groups – six Republican and two Democratic – also spent millions of dollars in the fall elections. Those phony issue ad groups are Wisconsin Manufacturers & Commerce, Americans for Prosperity, Greater Wisconsin Committee, Democratic Governors Association, Republican State Leadership Committee, Wisconsin Alliance for Reform, Wisconsin Firearms Owners, and Wisconsin Right to Life. For more information about the electioneering activities and spending by all of the outside groups involved in the fall legislative and statewide races, go to the Hijacking Campaign 2018 feature on the Democracy Campaign website or check out our earlier article on independent spending in the fall elections. It has been updated since its original publication date.